Authors: Wathen, J. J.; Pagán, V. R.; Suess, R. J.; Wang, K.-Y. ; Foster, A. C.; Murphy, T. E.
Abstract: We use pump-probe spectroscopy and continuous wave cross-phase and cross-amplitude modulation measurements to study the optical nonlinearity of a hydrogenated amorphous silicon (a-Si:H) nanowire waveguide, and we compare the results to those of a crystalline silicon waveguide of similar dimensions. 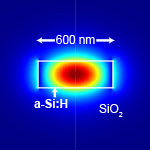 The a-Si:H nanowire shows essentially zero instantaneous two-photon absorption, but it displays a strong, long-lived non-instantaneous nonlinearity that is both absorptive and refractive. Power scaling measurements show that this non-instantaneous nonlinearity in a-Si:H scales as a third-order nonlinearity, and the refractive component possesses the opposite sign to that expected for free-carrier dispersion.